Bloggers4UKIP: Why does the US want the UK to stay in the EU? Why does the US want the UK to stay in the EU? Last week President Obama told us that we must stay in the EU and that we'll be "back of the queue" when it comes to setting up a trade deal when we leave. It has been noted that "back of the queue" is a very English thing for an American president to say. In the American vernacular he would be more likely to say "end of the line". Clearly there was some influence from this side of the pond in the president's speech. But why would Obama be so interested in keeping us in the EU? The US is the world's largest economy and naturally dominates world trade. Of the 15 trillion dollar economies, 5 of them (including the UK) are in the EU and have given up their seat at the World Trade Organisation and the right to negotiate their own trade deals. It is much easier for the US to dominate world trade with a third of the world's economic superpowers out of the equation. The UK is the world's 5th largest economy and this is despite being a member of the EU rather than because of it. The last thing the US wants is for the UK to have a strong and flexible economy able to eat into the American share of the global economic pie. But the main reason Obama so desperately wants us to stay in the EU is TTIP. The Transatlantic Trade & Investment Partnership is a trade agreement being negotiated behind closed doors between the EU and the US. National governments, MEPs and voters aren't allowed to know any of the detail of the agreement, it is being negotiated by unelected commissioners with the help of corporate lobbyists. TTIP will remove most tariffs on imports and exports which is a good thing but it will introduce Investor-State Dispute Settlement (ISDS) which isn't. ISDS is a mechanism that allows companies to sue national governments for doing something that harms their ability to make a profit. The US has written ISDS into its trade deals with its South and Central American neighbours and it has been a disaster for them. Columbia is currently being sued by a number of companies for loss of potential future earnings, the largest claim being for nearly £13bn which is about 20% of the country's national budget. That claim is for lost future earnings caused by the Columbian government turning part of the Amazon rainforest into a nature reserve where a mining company wanted to mine. In 2008, a quarter of such disputes being heard by international arbitration tribunals were cases brought against South American countries by US corporations. The UK accounts for 17.5% of the EU's entire economic output. If TTIP isn't signed before we leave the EU, the agreement will lose nearly a fifth of its value overnight and American companies will miss out on the right to sue the British government for limiting their ability to make a profit. 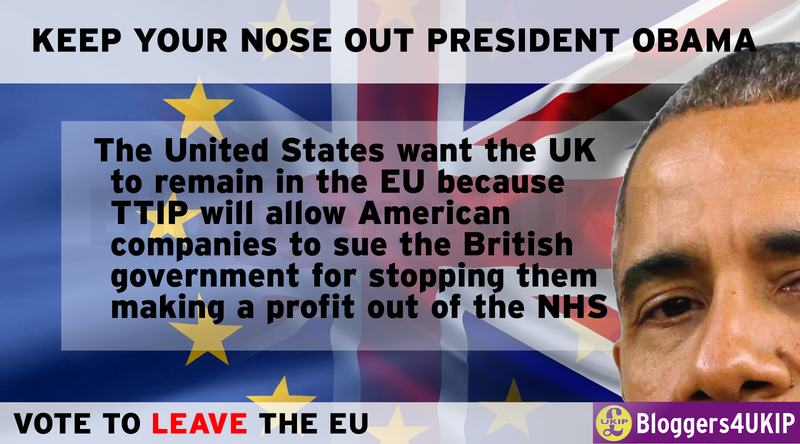 UKIP and others have tried and failed to secure an exemption for the NHS from TTIP to ensure the health service can't be forced into private hands through ISDS litigation. The big American healthcare providers will be able to sue the British government for not giving them a level playing field to compete with the NHS or allowing them to deliver services at the taxpayers' expense unless we're out of the EU before TTIP comes into force. Obama has no interest in what is best for the UK, he is only interested in what is best for his own country which is entirely the correct attitude for the president to have. World leaders look after their own interests, not talk their country down and deliberately undermine confidence in their own economy to suit their political agenda. Cameron may think that he's pulled off a coup by getting Obama to back him up on the EU referendum but all he's done is show himself to be a weak, manipulative little man.